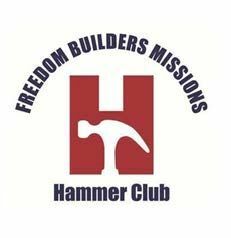 The HAMMER CLUB is a special group of folks who have pledged to give a set amount each month to Freedom Builders (Credit Card Giving available). All you have to do to be a member is for the next twelve months or more commit to giving to Freedom Builders. There is a $5/month minimum; and, if you pledge $25/month or more you will receive a special polo short embroidered with the FBHM emblem.